When manure is applied in the fall or in spring without incorporation at rates to meet the nitrogen (N) needs of corn, phosphorus (P) often ends up being applied at a rate that exceeds crop removal, leading to an increase in soil test P over time. When soil test P levels are low or medium, this is a desirable way to build P fertility. As soil test P increases, agronomic justification for application is reduced, and the soil may reach a level of P saturation where managing risk of P runoff becomes a priority. It is important for farms that land-apply manure to consider P build up and draw down over time. To reduce the rate of P buildup, manure rates will need to be reduced while meeting N requirements where possible. Immediate incorporation of manure in the spring conserves significant ammonia N and is one way to compensate for lower application of N and also keep P in line. Manure, either in liquid or in more solid form, contains organic material that can contribute to an increase in SOM over time. On the other hand, SOM can be negatively impacted by tillage. Here we show changes in SOM and soil nitrate after surface application of compost and manure at high rates versus lower rate of manure with chisel incorporation in a corn silage system. In 2001, an experiment was initiated in Aurora, NY, on a field that had no prior manure history. The study implemented five replications and six treatments: (1) low rate of composted dairy solids (P-based; 20 tons/acre), (2) high rate of composted dairy solids (N-based; 32 tons/acre), (3) low rate of liquid dairy manure with immediate (within one hour) tillage incorporation (P-based; 7,000 gals/acre), (4) high rate of liquid dairy manure application (N-based; 21,000 gals/acre), (5) zero N control (0 lbs N/acre) and (6) side-dress inorganic N (urea ammonium nitrate) at the recommended rate of 100 lbs N/acre. For field preparation, each plot was chisel-plowed, disked, and rolled using a cultimulcher. The low rate of manure received one extra pass of the chisel-plow (two passes in total) to incorporate the manure directly after application. Corn for silage was planted and harvested from 2001-2006. Soil Organic Matter: At the start of the experiment, the SOM was 3.5%. After five years of annual addition of high rates of compost, SOM had increased to 3.9% (Fig. 1). Addition of compost at the low rate did not increase SOM. Applying the high rate of manure did not impact SOM while the tillage-incorporation of the lower manure rate resulted in an 11% decrease in SOM (Fig. 1). The plots that did not receive any manure or compost showed an 18% decrease in SOM compared to the original levels (Fig. 1). ig. 1: Soil organic matter. Treatments were HC: high rate of compost; LC: low rate of compost; HM: high rate of manure; LM: low rate of manure; N0: zero N control; and N100: 100 lbs sidedressed N/acre. This figure is comparing soil organic matter in April 2006 with soil organic matter in April 2001 for each fertility treatment. Soil Nitrate: End-of-season soil nitrate was impacted by fertility management as reflected in the amount of nitrate present in 0-8 inch soil cores collected at three different time periods: immediately after harvest, December before snow, and the following April. We excluded the first two transition years and focused on the last three years of the study (2003-2005). Averaged over growing seasons 4, 5 and 6, once differences were observed, soil nitrate loss in the fall (from September to December) was highest where inorganic N had been used (38% loss). The large decrease in soil nitrate between September and snowfall (December) with inorganic N management of corn reflected N loss through leaching and/or denitrification. In compost amended plots, soil nitrate measured in December was 8% higher than what was measured in September (Fig. 2), suggesting that nitrate mineralization in that time period exceeded nitrate-loss. The same was seen for the plots that had received the lower rate of manure (Fig. 2). Fig. 2. Soil nitrate (0-8 inches) levels as influenced by fertility treatments from September to April (averaged over 2003-2005). Treatments were HC: high rate of compost; LC: low rate of compost; HM: high rate of manure; LM: low rate of manure; N0: a zero N control; and N100: 100 lbs sidedressed N/acre. These results suggest that when manure and compost are added, mineralization of organic N into nitrate continues between September and December. The following April, soil nitrate levels were similar among all treatments each year, showing a “reset” of nitrate levels reflecting weather in the fall, winter and spring. The nitrate dynamics for both the inorganic fertilizer plots and the manure and compost plots emphasize the importance of planting cover crop species with the ability to grow rapidly in the fall and to overwinter as some of the N lost between harvest and the planting the next spring could have been captured by winter hardy cover crops. In this experiment, SOM levels decrease in a tilled corn silage/hay/corn grain rotation, with all but the highest level of carbon addition in the high compost treatments. This suggests that application of manure during the corn years is not enough to improve SOM when regular tillage is also part of the management system. The benefits to increasing SOM are well known. For farms that want to increase SOM, it may be necessary to minimize tillage and include cover crops. A shift from high to low rates of manure and compost decreased end-of-season nitrate in the soil but, when combined with tillage-incorporation of the manure, negatively impacted SOM. Manure injection rather than tillage-based incorporation may counteract the negative impacts of a tillage-based manure incorporation system while conserving N and reducing soil test P buildup over time. Inclusion of overwintering cover crops when manure and compost are applied, will aid in capturing of N mineralized in the fall. This could also help with N supply in the spring as earlier work has shown somewhat suppressed yields with P-based application of manure and compost due to an N limitation. Sadeghpour, A., Q.M. Ketterings, G.S. Godwin, K.J. Czymmek. 2016a. Nitrogen vs. phosphorus-based manure and compost management of corn. Agronomy Journal 108: 185-195. Sadeghpour, A., Q.M. Ketterings, F. Vermeylen, G.S. Godwin, K.J. Czymmek. 2016b. Soil properties under nitrogen- vs phosphorus-based manure and compost management of corn. Soil Science Society of America Journal doi: 10.2136/sssaj2016.03.0086. This material is based upon work that is supported in part by Federal Formula Funds and the National Institute of Food and Agriculture, USDA, under Award no. 2013-68002-20525. Any opinions, findings, conclusions, or recommendations expressed in this publication are those of the authors and do not necessarily reflect the view of the USDA. We thank Aurora Ridge Dairy Farm for providing the liquid manure. Composted dairy solids were supplied by Willet Dairy (years 1 and 2) and Fessenden Dairy (years 3 through 5). For questions about these results contact Quirine M. Ketterings at 607-255-3061 or qmk2@cornell.edu, and/or visit the Cornell Nutrient Management Spear Program website at: http://nmsp.cals.cornell.edu/. Surface application of manure (i.e. without incorporation) to meet corn nitrogen (N) needs adds more phosphorus (P) than what corn and subsequent sod crops together can remove. This leads to buildup of P over time. To reduce the risk of long term soil test P (STP) buildup to excessive levels, at some point, manure rates need to be curtailed. Spring injection or immediate incorporation of a lower rate of manure increases the N-value of the manure and can avoid N limitation by a lower manure rate. The question addressed here is how effectively can switching from high rate of manure (N-based) to low rate with immediate incorporation (P-removal based) reduce STP buildup during five corn silage years? An experiment was conducted from 2001 to 2006 in a field with no prior manure history in Aurora, NY. The study had six treatments each replicated five times totaling 30 plots. Treatments were: (1) low rate of composted dairy solids (P-based; 20 tons/acre), (2) high rate of composted dairy solids (N-based; 32 tons/acre), (3) low rate of liquid dairy manure with immediate (within one hour) tillage incorporation (P-based; 7,000 gals/acre), (4) high rate of liquid dairy manure application (N-based; 21,000 gals/acre), (5) a zero N control (0 lbs N/acre) and (6) side-dress inorganic N (urea ammonium nitrate) at the recommended rate of 100 lbs N/acre. Field preparation consisted of chisel-plowing, disking, and cultimulching prior to planting silage corn. The low rate of manure received an extra pass of chisel-plow (two passes in total) to conserve ammonia-N.
Phosphorus balance: Application of P with low rates of manure and compost (P-based) was designed to meet 90 lbs P2O5/acre removal a year. The actual yearly P removal was 63 lbs P2O5/acre with the low rate of compost and 35 lbs P2O5/acre for low rate of manure, reflecting lower than anticipated yields and a lower P2O5 content of the corn (Table 1). The high rate of manure had the highest 5-yr average annual P balance (151 lbs P2O5/acre per year) and shifting to a low rate of manure decreased the P2O5 balance by 77% (Table 1). Changing the high rate of compost to a low rate of compost reduced the P2O5 balance by 45%. Both low rates of manure and compost were showing balances above zero (lower corn silage yield than anticipated) so we would expect an increase in STP in all four treatments. Soil test phosphorus: Compared to the initial levels (10 lbs P/acre), the high rate of manure led to a four-fold increase in STP as compared to a two-fold increase with a low rate of manure (Fig. 1). The highest STP increase occurred with the high rate of compost (6x), while the low rate of compost resulted in a three-fold increase in STP consistent with differences in P balances. Lower application rates resulted in slower buildup but because annual balances were positive for both application rates, an increase in STP took place for both the high and the low rates. Soil test P buildup with compost was faster (11 lbs P2O5/acre increased STP by 1 lbs/acre) than manure (25 lbs P2O5/acre increased STP by 1 lbs/acre) suggesting differences in nutrient sources in increasing STP over time (Fig. 2). Soil test P remained unchanged for inorganic N management. These data suggest that STP levels increase faster with compost application than with liquid manure application. Fig. 1. Soil test P (0-8 inches) levels as influenced by fertility treatments from April 2001 to April 2006. Treatments were HC: high rate of compost; LC: low rate of compost; HM: high rate of manure; LM: low rate of manure; N0: a zero N control; and N100: 100 lbs sidedressed N/acre. Fig. 2. Changes in STP (0-8 inches) as a function of P2O5 balances after five years of manure and compost addition to corn from April 2001 to April 2006. Treatments were HC: high rate of compost; LC: low rate of compost; HM: high rate of manure; LM: low rate of manure; N0: a zero N control; and N100: 100 lbs sidedressed N/acre. With water quality concerns, managing STP levels to reach, but not exceed, the agronomic optimum range will be increasingly important. This experiment shows that increases in STP levels can be better managed with appropriate conservation of manure N, allowing for lower overall rates. 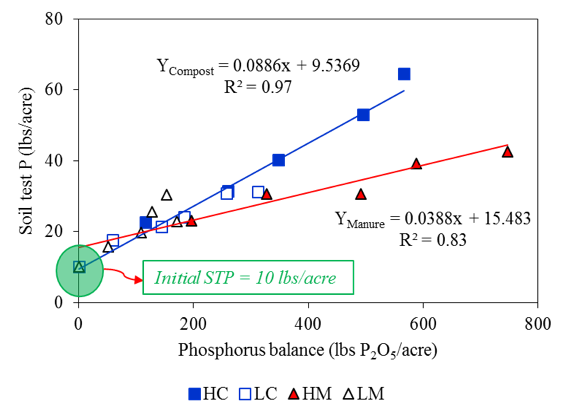 In addition, this research shows the importance of maintaining accurate yield records so actual P removal rates can be established and the importance of accurate manure records so management decisions can be made that focus on achieving P balance over crop rotations for soils in the agronomic optimum STP range. Interest in no-till planting soybeans into a rolled-crimped winter cereal cover crops is increasing among New York State organic grain farmers. This approach is also called “organic rotational no-till” because tillage is used to establish the cover crop in the fall. The rolled-crimped cover crop acts as mulch and helps suppress weeds in the summer. In addition to soil health benefits, this system has potential to save time and fuel by eliminating mechanical inter-row cultivation for weeds in organic soybean production. 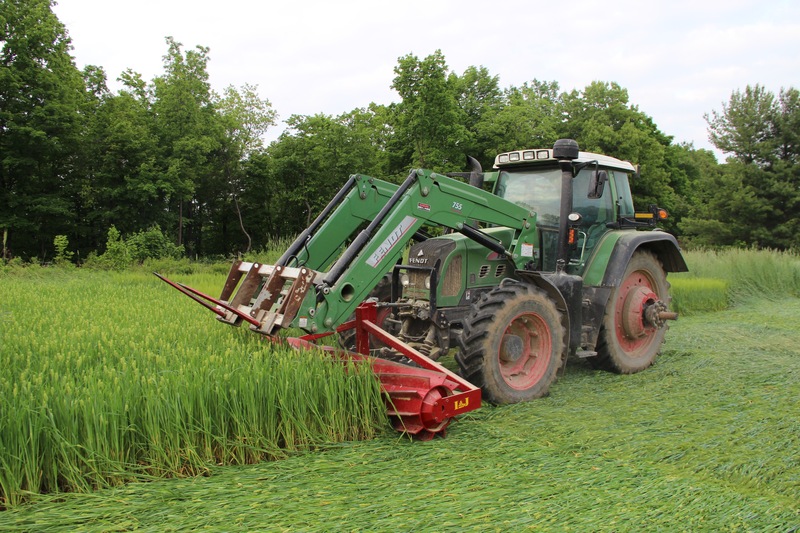 In September of 2013, cereal rye, winter barley, and triticale were planted at an organically managed farm in Penn Yan, NY in anticipation of rolling-crimping them for no-till soybean planting the following spring. Two cultivars were planted per species: ‘Aroostook’ and a variety not stated (VNS) rye, ‘McGregor’ and ‘Verdant’ barley, and ‘TriCal 718’ and ‘TriCal 815’ triticale. The six cultivars across three species were arranged in a randomized complete block design with four replications, and plots were 15 x 15 feet to accommodate farm-scale equipment. Immediately prior to rolling-crimping, cover crop biomass was sampled from each plot. Cover crop biomass was determined by clipping the plants at the soil surface within a 5.4-ft2 (0.5-m2) quadrat, oven-drying the vegetation at 122°F for one week, and then weighing the dried samples. Weed biomass samples were collected approximately 15 weeks after soybean planting, which corresponds to the maturation of one of the most dominant weeds in the experiment, common ragweed (Ambrosia artemisiifolia L.). Weed biomass samples were collected, dried, and weighed as described for the cover crops, except 2.7-ft2 (0.25-m2) quadrats were used. Soil types in this field were Cayuga silt loam and Honeyoye silt loam with 3-8% slopes. Soil test results showed the field was low in pH (5.7), P (3.8 lb/acre), and soil organic matter (2.0%). This was an on-farm trial in conjunction with a series of experiments at the Musgrave Research Farm in Aurora, NY and the USDA Beltsville Agricultural Research Center in Beltsville, MD, which explored how different cultivars and termination timing of these three rolled-crimped winter cereal species affected weed suppression and soybean crop performance. Previous research suggested that optimal termination timing with a roller-crimper occurs when winter cereal cover crops have reached anthesis (flowering, Feekes growth stage 10.51), which is typically between late May and early June in the Northeast, depending on the winter cereal cover crop species. With anthesis signifying the transition from vegetative to reproductive growth, cover crop termination with a roller-crimper can be as effective as termination with synthetic herbicides (Ashford and Reeves, 2003; Davis, 2010; Mirsky et al., 2009). Termination timing is particularly important for multiple reasons. If the cover crops are rolled prior to anthesis, termination can be incomplete and the cover crops will continue to grow, competing with soybean seedlings for light, water, and nutrients, and eventually producing seed that can become a weed later in the rotation. However, if termination timing occurs well past anthesis (i.e., too late), the winter cereal cover crops might similarly produce viable seed that can become a weed the following year, and late rolling will delay soybean planting, possibly reducing yield potential. Winter cereals were planted with an Amazone Airstar Profi combination drill-power harrow on September 16, 2013, and terminated in 2014 on May 30 and June 5 with a 10-ft front-mounted roller-crimper (I & J Mfg., Gordonville, PA; Figure 1). The cover crops were drilled 1 inch deep in 5-inch wide rows with an Esch No-Till 5507 on the same day, and immediately after, rolling-crimping (Figure 2). Cereal grains can mature quickly in mid-May, which makes frequent growth stage scouting particularly important during that period of time. Feekes growth stages were 10.5, 10.54, and 11.1 for triticale, rye, and barley at the early termination date (May 30) and 10.54, 11.1, and 11.2 at the later date (June 5), respectively. These stages correspond to the onset of flowering (anthesis) through milky ripe for the early termination date, and the end of flowering through soft dough for the later date. Figure 1. Front-mounted roller-crimper unit flattening a barley cover crop at the on-farm site. The blunt meal blades on the cylinder crimp, rather than cut, the cover crops. Filled with water, the roller-crimper weighs approximately 2600 lb. Figure 2. Indentations in the rolled cover crops represent soybean drilled in 5-inch rows at the on-farm site in 2014. Extra weight was added to the drill to help penetrate the thick mulch and hard, dry soil. Cover crop biomass. Winter cereal biomass production at this site was relatively high, with over 8000 lb/acre for rye, 7000 lb/acre for triticale, and 5000 lb/acre for barley across both dates (Figure 3). After being rolled, the cover crops form a thick layer of mulch (Figure 4), which serves as the primary source of weed suppression in this system. Figure 3. Cover crop biomass production at two termination dates in 2014. 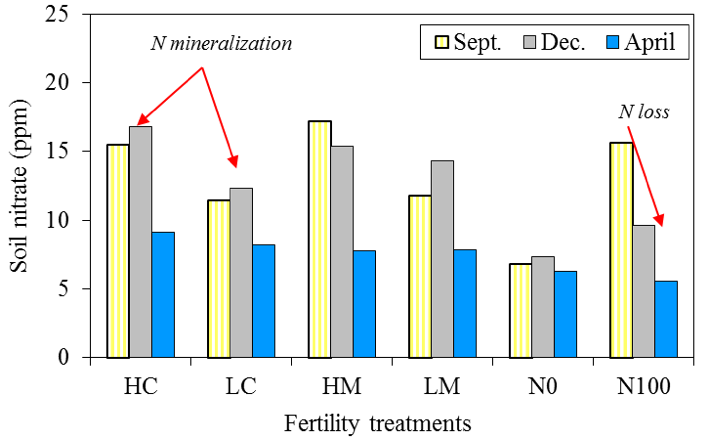 Error bars represent the standard error of the mean, and bars with the same letters represent values that are not significantly different at P < 0.05. Figure 4. Deep layer of weed-suppressive cover crop mulch. Based on work by Teasdale and Mohler (2000), achieving at least 7000 lb/acre of cover crop biomass at termination is likely to result in good weed suppression when rolled-crimped in this system (Mirsky et al., 2012; Mirsky et al., 2013). 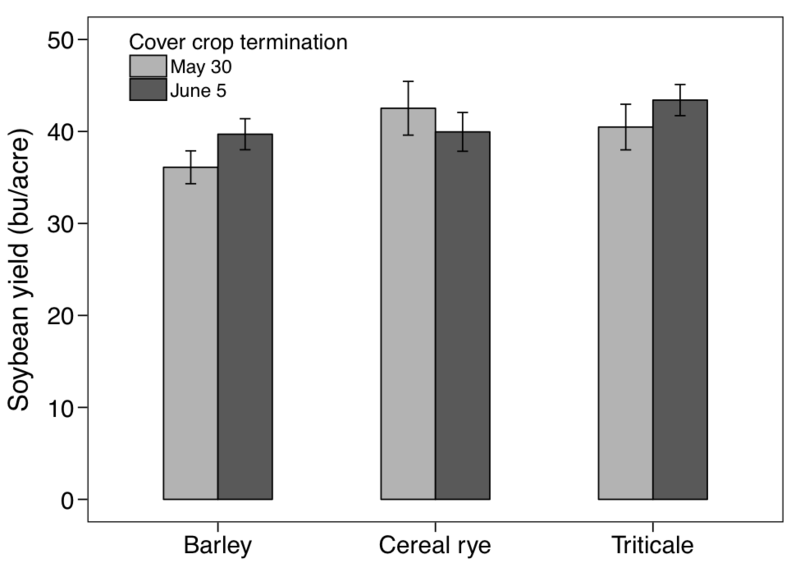 Thus on both planting dates, the rye and triticale cover crops produced enough biomass to exceed the recommended threshold, but barley did not. However, too much cover crop biomass can also be a problem. Lodging of up to 60% of the plants in a given plot was observed in rye terminated at the late termination date. As coulters on no-till planters and drills are not typically designed to cut through large amounts of residue, lodged plants that lay diagonally or perpendicular to the direction of rolling-crimping and no-till planting can impede adequate soybean seed placement, which can reduce germination and potentially decrease soybean yield. Also, if hair-pinning (i.e., residue forced into the furrow) is particularly problematic, poor seed-to-soil contact can result in gaps in the canopy, which can reduce late-season weed suppression. Cover crop bounce-back was relatively low across all treatments with less than 20% of the barley plants “standing back up” after rolling-crimping, and less than 15% of the triticale and 10% of the rye plants doing the same. It is unlikely that the incompletely-terminated cover crops—most of which stood at a 45° angle and simply died at a slower rate than their flattened counterparts—impacted soybean yield. However, the resulting seed some cover crop plants produced might have resulted in volunteer cover crops in the following year. It is worth noting that no-till drilling soybean seed into rolled cover crop mulch is not the recommended practice for most situations (Mirsky et al., 2013). Drilling can require adding a considerable amount of additional weight to the drill units to achieve acceptable, uniform planting depth if soil conditions are dry. Instead, a no-till planter set at 15- or 30-inch rows tends to perform better over a wider variety of soil conditions and biomass levels. We used a drill for the on-farm trial because it was the only no-till equipment available. Similarly, rolling-crimping and no-till drilling would ideally be completed in a single pass, but two operations were required in this experiment because the no-till drill width did not match the width of the roller-crimper. Weed biomass. Across all treatments, weed biomass in early fall (September 15) tended to be lower in plots with greater cover crop biomass (measured before rolling-crimping). 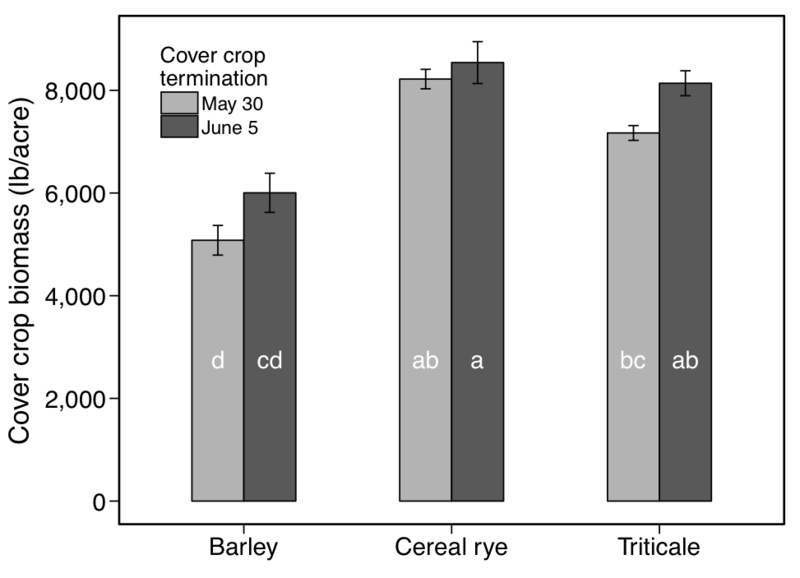 We observed lower weed biomass in late-terminated rye and triticale compared with early-terminated barley (P < 0.05), but weed biomass was not statistically different between the two termination dates within each species (Figure 5). Figure 5. Weed biomass in early fall for two cover crop termination dates in 2014. 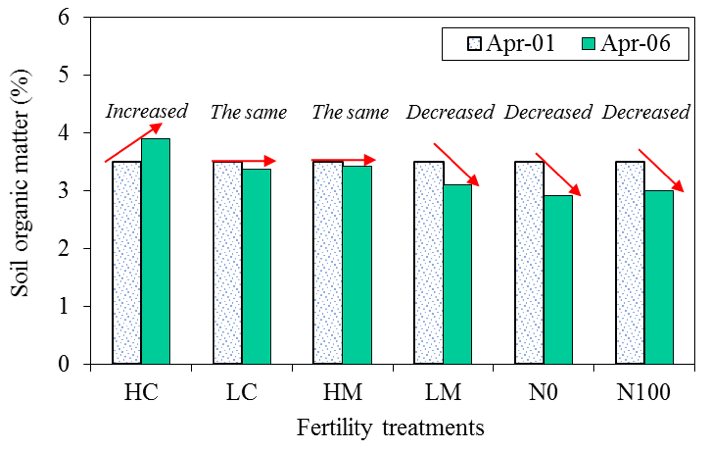 Error bars represent the standard error of the mean, and bars with the same letters represent values that are not significantly different at P < 0.05. The perennial weed quackgrass (Elymus repens [L.] Gould) comprised 44% of the total weed biomass across all treatments. Across all species, mean quackgrass biomass was 512 lb/acre at the early termination date and 294 lb/acre at the late termination date (P = 0.08). This is an important consideration, since perennial weeds tend to proliferate in the absence of tillage. Common ragweed was the other dominant weed species in the experiment at 42% of the total weed biomass across all treatments. Similarly, mean common ragweed biomass was lower (P = 0.09) in the cover crop treatments terminated later (220 lb/acre) compared with the earlier termination date (541 lb/acre). Soybean yield. Soybean yield was relatively high across all treatments, averaging 40 bu/acre (Figure 6). Even if weeds do not reduce crop yield, they can produce seeds and cause problems for future crops in the rotation. 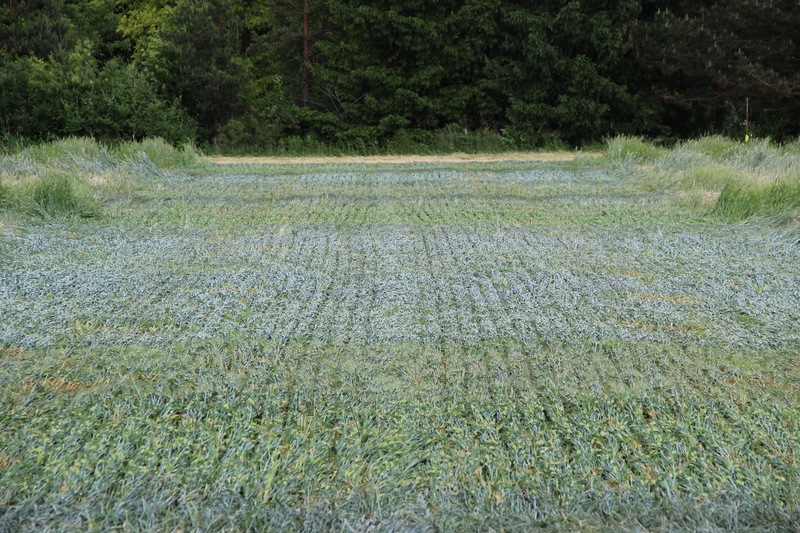 In this trial, late-terminated rye and triticale produced similar results, with high cover crop biomass, minimal cover crop bounce-back, low weed biomass, and relatively high soybean yields. 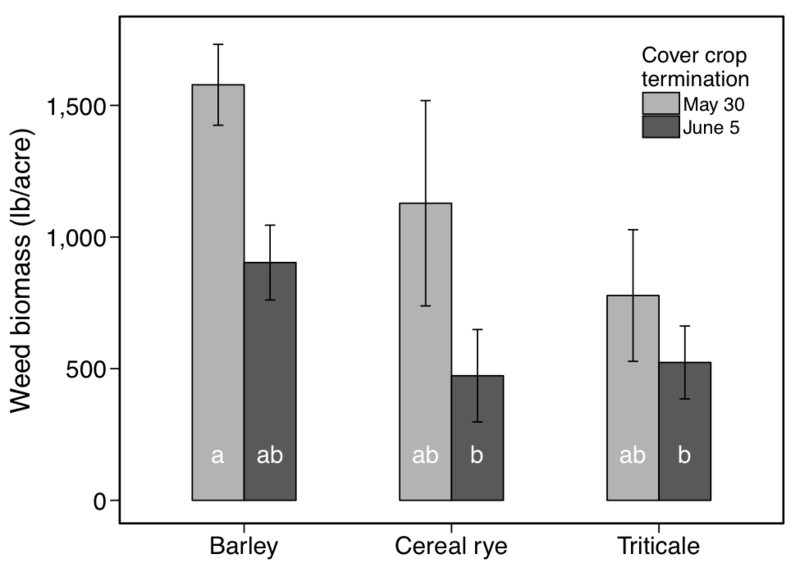 Although soybean yield was not statistically different, early-terminated barley had the lowest cover crop biomass and greatest weed biomass (Figures 3 and 5). Thus, our results indicate that rye or triticale perform better than barley in this system, and terminating the cover crops at a slightly later date can be advantageous for reducing weeds (especially quackgrass and common ragweed) without sacrificing soybean yield. Watching the weather. Soil moisture conditions are also very important to consider. 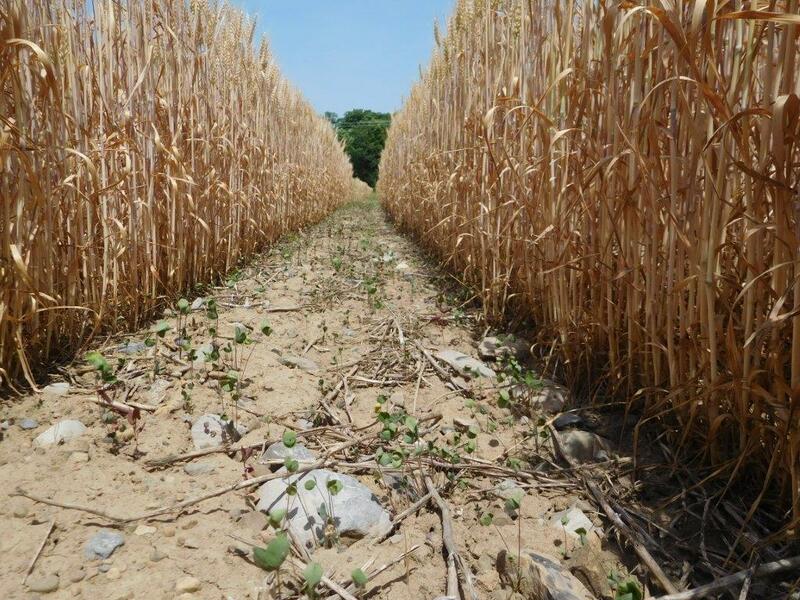 In an extremely dry spring, such as in 2016, transpiration from a dense cover crop stand can reduce soil moisture, which can inhibit soybean seed germination and reduce yield potential. When the soil is this dry, the best option might be to forgo planting soybean entirely. Instead, it might be advisable to allow the cover crop to grow to maturity, harvest it, and plant a different crop afterwards. In most years in New York, however, limited spring rainfall is not a problem. Still, winter cereal cover crops can dry out the surface of the soil, making seed placement difficult. In this situation, we have found that adjusting planting dates based on rain events can be helpful to ensure the planter can penetrate the soil and achieve good seed-to-soil contact. In addition to no-till planting right after a rain, another trick that we have used is to add weight to the planter to increase the down pressure on the front coulters. Figure 6. 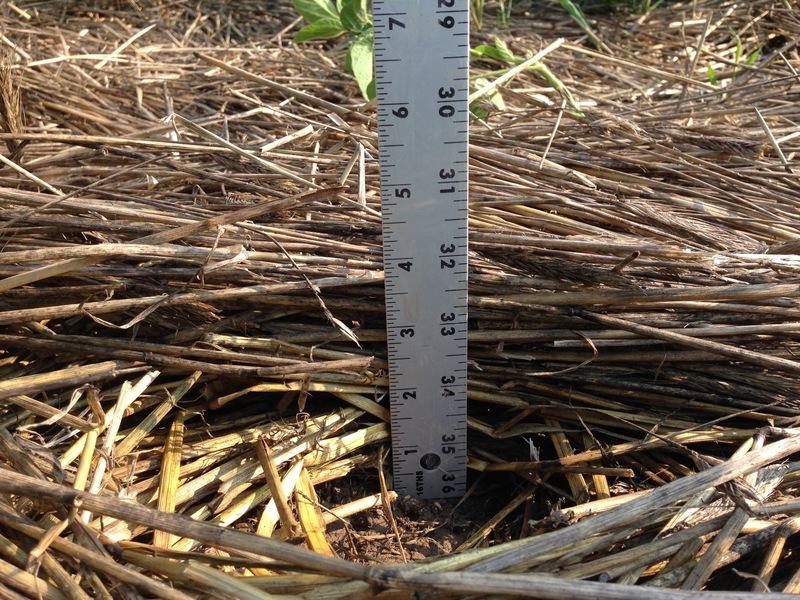 No-till planted soybean yields in rolled-crimped cover crops at the Martens Farm in 2104. 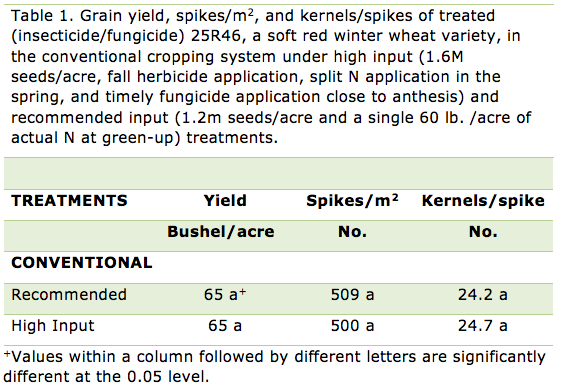 Yields were not significantly different (P < 0.05) across all treatments. Conclusions. This on-farm trial augmented our research farm experiments in several ways. We had high cover crop biomass production at this site, and we were able to observe the results from different types of equipment than were used at the Musgrave Research Farm or Beltsville Agricultural Research Center. Perhaps most importantly, the good yields on this small field gave the farmer confidence in using this method on more soybean acres, and he has since advocated this approach at farmer meetings. However, our on-farm results were only from one year, so trials on more sites and over more seasons are needed to refine our management recommendations. This work was supported by a joint research and extension program funded by the Cornell University Agricultural Experiment Station (Hatch funds) and Cornell Cooperative Extension (Smith Lever funds) received from the National Institutes for Food and Agriculture (NIFA) U.S. Department of Agriculture (Project: 2013-14-425). Any opinions, findings, conclusions, or recommendations expressed in this publication are those of the authors and do not necessarily reflect the view of the U.S. Department of Agriculture. Wheat height was normal but kernel set and/or retention and kernel weight was low in recommended input (left) and high input (right) treatments on a somewhat droughty soil at the Aurora Research Farm in the dry 2016 growing season. High input wheat, which is characterized by high seeding rates, herbicide application in the fall, split-application of N in the spring resulting in higher total N rates, and a timely spring fungicide application(s) was introduced to New York in the 1980s. Known as intensive management of wheat in the 1980s, it was modeled after European wheat management systems, where yields were often twice that of NY wheat yields. As in the 2000s, consultants or farmers from other countries or regions came to NY to share with NY farmers and industry how they grew wheat. We conducted in-depth studies at the Aurora Farm in the 1980s and reported that yields were increased (10-15%) in 3 years but limited in response (2-5%) in 2 other years. More importantly, we found that intensive management of wheat did not pencil out unless prices exceeded ~$3.75/bushel, relatively high prices back in the 1980s. Wheat prices in NY plummeted to $2.80/bushel in 1985 and $2.25/bushel in 1986, which abruptly ended the push to adopt intensive management of wheat in NY until the 2000s. Wheat prices in NY averaged ~$2.80/bushel in 2003 and 2004 and increased to $3.35 in 2005 and $4.00/bushel in 2006 so high input wheat management was hardly mentioned in NY. Once prices skyrocketed to $6.95/bushel in NY in 2007 and averaged $6.50/bushel from 2008-2013, high input wheat management became the mantra for wheat production in NY. In addition, wheat yields in NY also increased significantly averaging 64 bushels/acre from 2008-2013 compared with 55 bushels/acre from 2002-2007. Consequently, some growers believed that high input management was solely responsible for the high wheat yields, despite the introduction of newer high-yielding varieties and favorable weather conditions for high wheat yields. Wheat prices have plummeted over the last year with NY growers now receiving less than $4.00/bushel for their wheat. The question that once again arises, as it did in the mid-1980s, “does high input wheat pencil out, if wheat prices remain at $4.00/bushel or lower”? We compared high input and recommended input management in conventional (and organic) wheat at the Aurora Research Farm in 2016, a year characterized by very dry conditions from March through June (6.52 inches total). This article will focus exclusively on comparing high and recommended input wheat in conventional management. 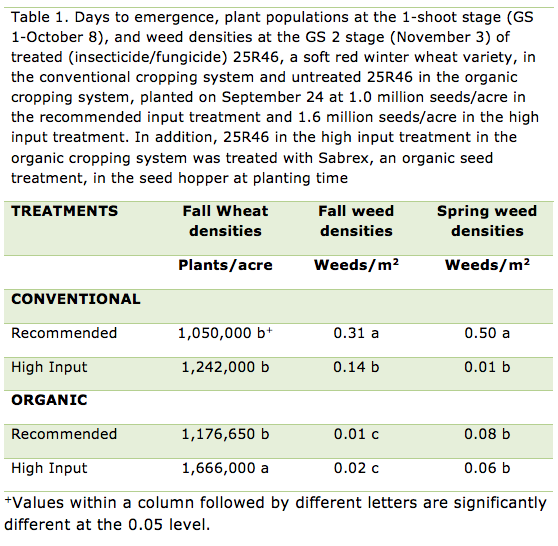 Management inputs were detailed in another article in this issue (http://blogs.cornell.edu/whatscroppingup/2016/09/26/organic-wheat-looked-great-but-yielded-7-5-less-than-conventional-wheat-in-20152016/). Briefly, high input wheat was seeded at 1.6M seeds/acre, received an herbicide application (Harmony extra) in the fall, a split-application of N in the spring (~45 lbs. /acre of actual N at green-up and another ~45 lbs. /acre of actual N at the end of the tillering period in late April) and a timely fungicide application (Prosaro) at the end of May, just before anthesis. In contrast, recommended input wheat was seeded at 1.2M seeds/acre and received a single 60 lb. /acre application of actual N at green-up in late March. We sub-sampled 1.52 m2 areas (8 rows by 1 meter) in two locations of all wheat plots to determine yield components of all treatments on July 5, the day before harvest. The sub-samples were first weighed, and then the spikes were counted. The spikes were then threshed so all the kernels (~20,000 kernels/sample) could be counted with a seed counter before being weighed. From the sub-sample data, we determined spikes/m2, kernels/spike, kernel weight, and harvest index (grain yield/total dry matter yield) of all the treatments. Surprisingly, there was no response at all to high input wheat on the doughtiest soil at the Aurora Research Farm in the dry 2016 growing season (Table 1). Although we planted on September 24 and the warm fall and winter allowed the wheat to break dormancy in mid-March in excellent condition, yields were lower than expected. Apparently, the dry conditions from March through June and relatively droughty soils contributed to the somewhat disappointing yield. Spike number at harvest, the typical ~500 spikes/m2 in NY wheat, did not differ between high and recommended input treatments (Table 1), despite the higher seeding rate and resultant higher plant density of the high input treatment (http://blogs.cornell.edu/whatscroppingup/2016/09/26/organic-wheat-looked-great-but-yielded-7-5-less-than-conventional-wheat-in-20152016/). Evidently, the 60 lb. /acre N rate at green-up stimulated tillering of the recommended input treatment, negating the potential lower spike density associated with the lower plant density. 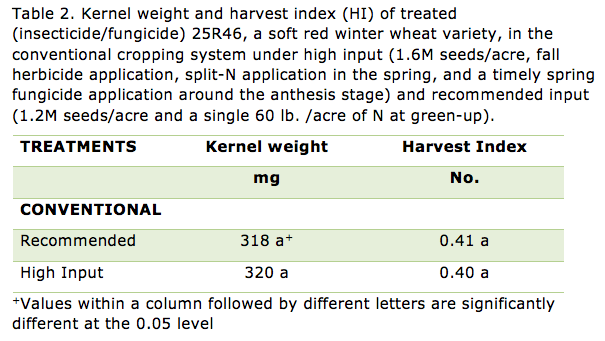 Likewise, kernel number/spike (~25/spike) and kernel weight (~320 mg) did not differ between the high and recommended input treatments (Tables 1 and 2). Kernels/spike and kernel weight were exceedingly low in this study compared with the typical 35-40 kernels/spike and 350-400 mg kernel weight for wheat produced in NY. Apparently, the lack of rainfall, especially in June (0.74 inches), coupled with the somewhat droughty soil, resulted in limited kernel set and/or retention as well as low kernel weight. The dry conditions also contributed to the low but similar harvest index values of ~0.40 for both treatments (Table 2). In conclusion, wheat did not respond to high inputs on this somewhat droughty soil in Cayuga Co. If growers practiced high input instead of recommended input management with similar yield results, net returns would have much, much lower (higher seeding rate, three additional trips through the field for herbicide, a split-N, and fungicide applications, and the added cost of herbicide, additional N, and fungicide). Again, the dry conditions undoubtedly minimized leaching or denitrification of the single N application in late March and disease pressure throughout the spring cancelling out a response to those additional inputs. Also, yield responses to high input wheat seem to be more prevalent in western NY where growing conditions are more similar to SW Ontario and Michigan where growers have had excellent results with this management system. In central NY, I have found the responses to be more variable. So, if you are a grower who is averse to having yields lowered because of potential stand loss due to harsh winter conditions, potential weed problems, potential loss of N from a single application at green-up, or potential yield losses from spring diseases, I would suggest using high input management at all times. On the other hand, if you are a grower who is risk averse to spending $ on inputs where there is not a guarantee of an economical return, I would recommend managing the crop according to the growing season and field conditions. If winter annuals or perennial weeds are present in the fall, herbicide application is warranted. But if weed pressure is low in November, the competitive nature of the wheat crop will probably keep weed densities relatively low in the spring. Likewise, if April conditions are wet, it would be prudent to apply additional N in late April, even with a single 60 lb. /acre application in March. But certainly in years with dry March and April conditions, such as in 2016, additional N would not be needed, especially on soils that are not excessively or somewhat poorly drained. Finally, if wet conditions persist before anthesis and are predicted to remain wet during and shortly after anthesis, a timely fungicide application is certainly the best management practice. But if dry conditions have prevailed and are forecasted to remain dry, a fungicide application may not be warranted. Wheat is currently selling for less than $4.00/bushel in NY so wheat growers should factor that into their management inputs. The lower leaves of wheat were senescing in mid-June, despite more N being applied to high input conventional wheat (right), because of exceedingly dry conditions at Aurora and the droughty soil of the experimental area. We initiated a 3-year study at the Aurora Research Farm in 2015 to compare the corn, soybean, and wheat/red clover rotation with different crop sequences in conventional and organic cropping systems during the 3-year transition period (2015-2017) to an organic cropping system. Three of the many objectives of the study are to determine 1) the best entry or 1st year crop (2015) to plant during the transition, 2) the best crop sequence during the 3-year transition (soybean-wheat/red clover-corn, corn-soybean, wheat/red clover, or plowed in red clover-corn-soybean) and 3) do corn, soybean, and wheat respond similarly to management inputs (high and recommended) in conventional and organic cropping systems? This article will compare the agronomic performance of organic wheat with conventional wheat following soybean in a soybean-wheat/red clover-corn sequence during the second year of the transition from conventional to an organic cropping system. We used a John Deere 1590 No-Till Grain Drill (7.5 inch spacing between drills) to plant the treated (insecticide/fungicide seed treatment) Pioneer soft red wheat variety, 25R46, in the conventional cropping system; and the untreated 25R46, in the organic cropping system at two seeding rates, ~1.2 million seeds/acre (recommended input) and ~1.6 million seeds/acre (high input treatment) on September 24, the day after soybean harvest. We applied about 200 lbs. /acre of 10-20-20 as a starter fertilizer to wheat in both conventional treatments. We also applied Harmony Extra (~0.75 oz. /acre) to the high input conventional treatment at the GS 2 stage (November 5) for control of winter perennials (dandelion in particular). In both organic treatments, we applied the maximum amount of Kreher’s composted chicken manure (5-4-3 analysis), as a starter fertilizer, that would flow through the drill, or about 150 lbs. of material/acre. We also broadcast Kreher’s composted manure to provide ~60 lbs. of actual N /acre (assuming 50% available N from the composted manure) in the high input treatment in the organic cropping system immediately after planting. In addition, we also added Sabrex, an organic seed treatment with Tricoderma strains, to the seed hopper of 25R46 in the high input treatment in the organic cropping system. We frost-seeded red clover into all the wheat treatments on March 9 to provide N to the subsequent corn crop in 2017. We applied ~60 lbs. of actual N/acre (33-0-0, ammonium nitrate) in the recommended input treatment in the conventional cropping system on March 21, about a week after green-up. In the high input conventional treatment, we applied ~45 lbs. of actual N/acre (33-0-0) on March 21 and then applied another 45 lbs. of actual N/acre on April 25 about a week before the jointing stage (GS 6). We also applied a fungicide (Prosaro) to the high input treatment on May 31. We applied Kreher’s composted chicken manure to provide 75 lbs. of available N/acre in the recommended input treatment on March 21. Also, we applied an additional 55 lbs. of available N/acre to the high input treatment in the organic cropping system on March 21. All the plots were harvested with an Almaco plot combine on July 6. We collected a 500 gram from each plot to determine kernel moisture and test weight in the laboratory. We presented data on wheat emergence as well as wheat densities and weed densities in the fall (http://blogs.cornell.edu/whatscroppingup/2015/11/23/wheat-emergence-early-plant-populations-and-weed-densities-following-soybeans-in-conventional-and-organic-cropping-systems/) and weed densities in the early spring (http://blogs.cornell.edu/whatscroppingup/2016/04/05/no-till-organic-wheat-continues-to-have-low-weed-densities-in-early-spring-march-31-at-the-tillering-stage-gs-2-3/) in previous news articles. Briefly, organic wheat emerged about 1 day earlier, had ~10% more plants/acre, and fewer weeds in the fall. In the spring, organic wheat also had lower weed densities when compared with the recommended input treatment in conventional wheat (no herbicide) and the same weed density as the high input conventional wheat (received an herbicide after fall weed counts) in the spring (Table 1). Consequently, organic compared with conventional wheat had a similar or higher yield potential in early April, the beginning the active spring tillering period, based on stand and weed densities. Nevertheless, the 10% greater plant density and lower weed density in organic compared with conventional wheat, especially in the recommended input treatment, did not translate into a yield advantage. In fact, organic wheat yielded ~7.5% lower than conventional wheat (Table 2) when averaged across input treatments (no response to high input treatments in either cropping system). We suspect that the use of an organic N source may have resulted in less available N to the organic wheat crop, although visual symptoms of N deficiency were not observed. We did sub-sample before harvest (two 1.52 m2 areas/plot) to determine yield components. Organic compared with conventional wheat did have higher spike densities (533 to 509/m2, respectively) probably because of its higher plant density. 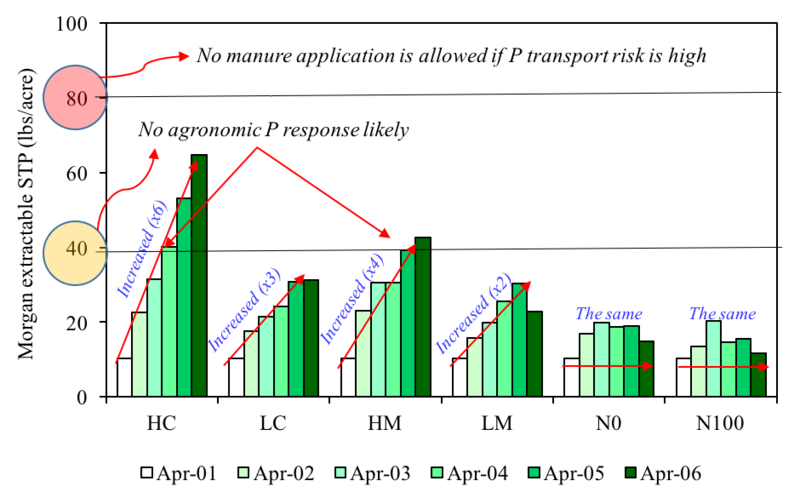 Organic wheat, however, had fewer kernels/spike (22.1 vs. 24.5, respectively) and lower kernel weight (311 vs.315 mg, respectively), which indicates that the organic wheat may have been short of N, similar to organic corn in 2015 (http://blogs.cornell.edu/whatscroppingup/2016/03/29/why-did-organic-compared-with-conventional-corn-yield-30-lower-during-the-first-transition-year/). On the other hand, the recommended input (~75 lbs. of N/acre applied in late March) treatment yielded the same as the high input (~60 lbs. of N/acre in the fall followed by another ~55 lbs. /acre of N in late March) treatment in the organic cropping system. If available N were the limiting factor in organic wheat yields, then we would expect the high input treatment to yield higher because it received more total N (albeit at different timings). We will submit our wheat samples for total kernel N analysis. If total kernel N in organic and conventional wheat is similar, then total N availability may not have resulted in the 7.5% lower yields. Then we would have to explore the idea that perhaps the use of Kreher’s composted chicken manure as a starter fertilizer may not have provided adequate P or K to organic wheat. In conclusion, organic wheat, despite not receiving an insecticide/fungicide seed treatment, had better stands than conventional wheat and fewer weeds in both the fall and spring. Organic wheat, however, yielded 7.5% lower than conventional wheat in the second year of the transition from conventional to an organic cropping system. We expect that net returns will also be ~7.5% lower for organic compared with the recommended input conventional treatment because the lower seed costs, associated with no insecticide/fungicide seed treatment, will be offset by the higher costs for N, associated with the cost of Kreher’s composted chicken manure vs. ammonium nitrate. 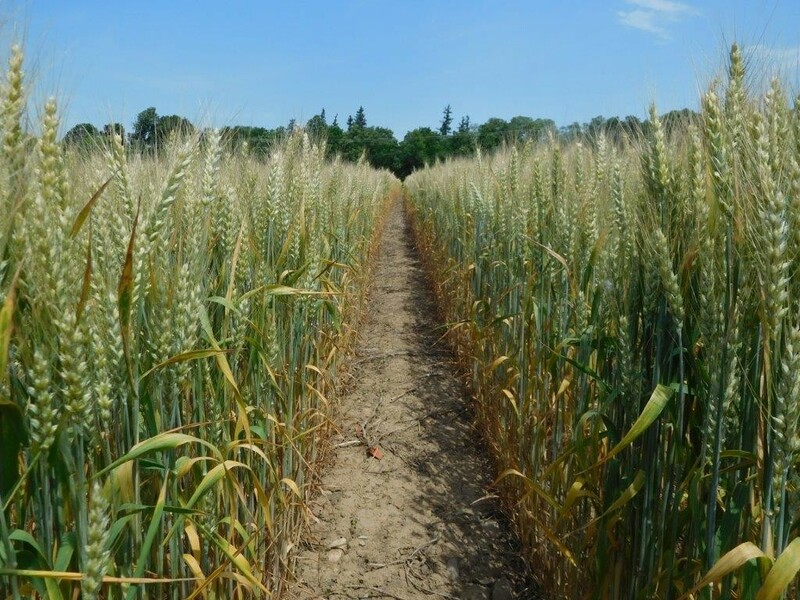 Many growers, however, practice high input wheat (high seeding rates, fall herbicide application, split N application, and a fungicide application), which provided no additional yield response to conventional wheat in the dry 2016 growing season. Consequently, organic wheat with recommended inputs will provide a greater return to conventional wheat with high inputs in this study in 2016. New York State has always presented a unique challenge to grain growers due to the large amount of in field variability. In recent years, growers have also added adverse weather conditions to that list. From the project’s perspective, two of the past three growing seasons have fallen far outside the conditions of a normal year. The 2015 season brought early precipitation amounts far above than the historical average while the 2016 season is setting up to be one of the driest in decades. 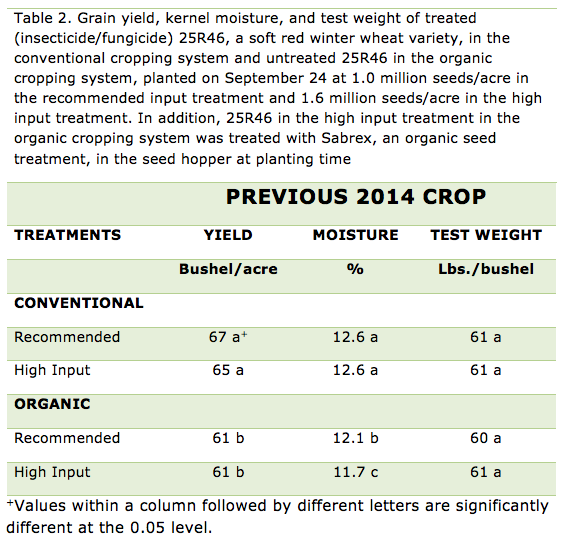 These conditions have resulted in significantly lower, less uniform yields than a typical year such as 2014 (Figure 1). Variable rate seeding technology is one of the many tools that NYS growers can use to help overcome these challenging conditions. However, mainstream companies have yet to design a prescription writing software that is developed to meet the unique conditions of New York State and the Northeast. This project seeks to address this void by developing a software that will do just that. The project has been collecting data on a large scale since 2014 in order to create a model that will select hybrids and population rates given certain soil properties and characteristics. To do this, six major data types are being examined; seeding rate, hybrid, topographical information, NRCS soil survey maps, Veris soil sampling data, and grid soil sampling data. Each data type consists of many variables which are analyzed individually and as interacting networks. Figure 2. This example random forest regression analysis demonstrates that phosphorus is the variable with the largest effect on yield in this field. 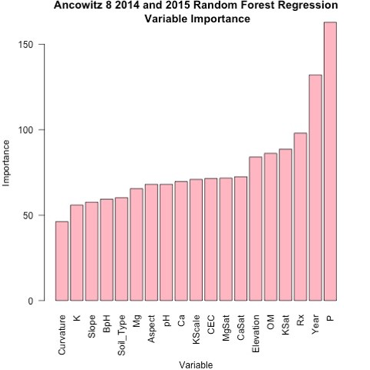 To examine the effect that each variable has on yield, a statistical approach called random forest regression is being used. This method essentially ranks each variable based on its importance to yield. The greater the importance number that is assigned to a variable, the larger effect that variable has on yield (Figure 2). The project has seen that the variables can rank very differently given the field, crop type, or year. Each field location is unique and thus has a unique combination of variables influencing yield. 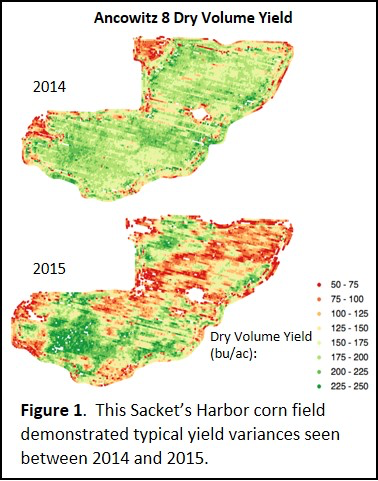 Some fields exhibit a very strong yield response to seeding rate, while others exhibit a strong yield response to fertility factors or topography. Figure 3. 2014 and 2015 resulted in similar population curves on this corn field in Clyde, NY. Though each field may be different, it is important to see stability within a field across years. For example, this 80 acre corn field in Clyde, NY produced similar population curves in two drastically different seasons. The first year, 2014, resulted in high and uniform yields across the field. 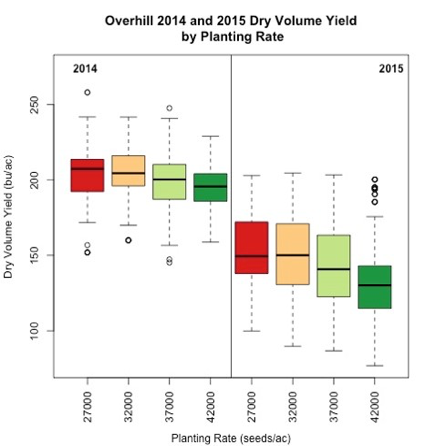 The second year, 2015, yielded dramatically lower with a large variance in yield uniformity. Though the two seasons were very different, both demonstrated a negative yield response to increased seeding rate (Figure 3). The lowest rate of 27,000 sds/ac yielded the highest across the two years and which was 5,000 sds/ac lower than the grower’s typical rate. 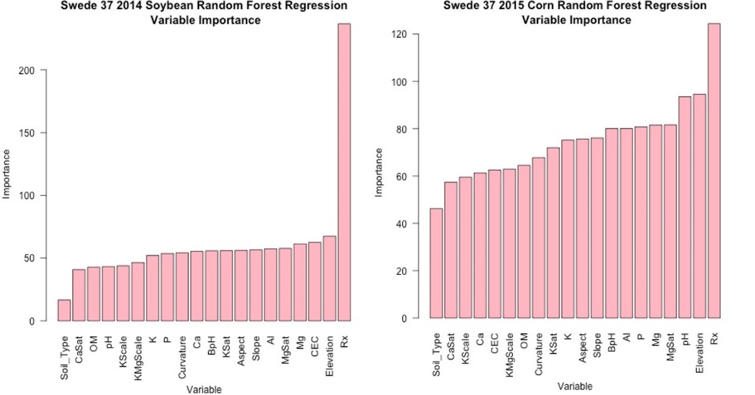 The random forest regression confirmed that seeding rate was the most important variable influencing yield across both years. Figure 4. Random forest regression analysis of 2014 soybean and 2015 corn of a sixty acre field in Pavilion, NY. To explore the idea of physiological differences between corn and soybean, some further analysis was conducted. In this same Pavilion field, soybean exhibited positive relationships with calcium and pH, while corn exhibited negative relationships with the same variables. These observations are likely related to the differences in crop preference for pH. Soybeans grow best in more neutral soils where the rhizobia bacteria that provide the soybean plant nitrogen are most active. Whereas the corn plant is known to prefer a slightly acidic soil where some key micronutrients, such as zinc and manganese, are more available. It is understanding relationships such as these from an agronomic and a statistical perspective that will result in a reliable model for NYS growers. This year has marked the first infield testing of the model which will provide side by side comparison of grower practice to the model’s prescriptions. Each year of additional data collected will serve to further the development of the model into a robust and reliable resource to growers of the State. The project is currently looking to bring on additional participants for the 2017 season and encourages any interested growers to contact Savanna Crossman at (802) 393-0709 or savanna@nycornsoy.com .